Professor Min Wu is recognized for her professional service and leadership. 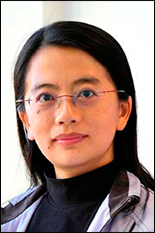 Professor Min Wu (ECE/ISR/UMIACS/MC2) has been selected to receive the 2015 Institute of Electrical and Electronics Engineers (IEEE) Signal Processing Society Meritorious Service Award for exemplary service to and leadership in the Signal Processing Society. Min Wu is a professor of electrical and computer engineering. She is also a member of the Institute for Advanced Computing Studies and the Institute for Systems Research at the University of Maryland. Wu currently leads the Media and Security Team (MAST) in the Clark School of Engineering with main research interests in information security and forensics, and multimedia signal processing. The award will be presented at the opening ceremony of the 41st annual IEEE International Conference on Acoustics, Speech, and Signal Processing (ICASSP) 2016 which will take place March 20-25, 2016 in Shanghai, China. On the first full day of the conference an announcement will be made regarding the award and 2016-17 President Rabab Ward will present the award to Professor Wu.